(NNPA) – When the now infamous offshore BP oil rig first blew up, some called it another Katrina and many of us took that as an insult. The pain and suffering caused by Hurricane Katrina (August 2005) were biblical and were fanned by the slow response of our own federal government. It wasn’t until former New Orleans Mayor Ray Nagin got on the airwaves and screamed with hysteria that attention was brought to the tragedy. It was an international disgrace and the flashbacks of humans suffering at the Louisiana Super Dome and the Convention Center still haunt our minds. The BP oil spill is subtle and not as spontaneous. However, there appears to be no end in sight and, worst of all, no answer. What we have going on here is a monster that is growing exponentially by the day. This is quickly becoming the worst environmental disaster in the history of the earth and it has yet to actually begin its deadly actions on our wildlife, our land and our people. It appears that our worst fears are coming true and no one has exaggerated the ill effects about to leap upon us. It is like a small community has a “fire” but there is no fire department. The fire is spreading and is going to affect many states, oceans and nations. This too will be biblical and no end is in sight. The blame goes to a few and the pain will affect millions. BP has been cheating in its operations. It has ignored due diligence and circumvented the standards set by the U.S. Department of Interior. Its partners, Halliburton and Transocean, have been equally derelict in their duties. Also, the Department of Interior appears to have been incompetent in its enforcement of the rules and permit requirements. All of this adds up to a disaster waiting to happen and, baby, it has happened. Since the oil rig blew up and oil began spewing from the ocean floor, there is an extreme need to stop the leak. That is the biggest problem of all. No one knows how to stop the leak. It is amazing – not the oil corporations involved nor the U.S. government can figure out this leak. Clearly, it is not rocket science but still no one had a plan in place that would address this situation. They are trying to figure it out as they go and that is extremely frightening. 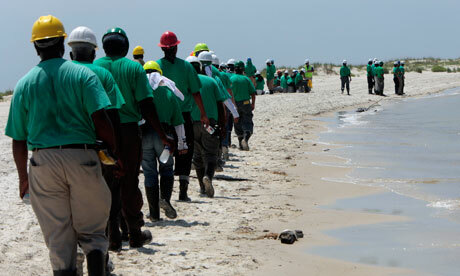 BP has been trying to fake us out by announcing that 5,000 barrels of oil leak per day. However, others have estimated it to be much larger and the video shots that have finally been released show that BP is trying to trick us. One Purdue University professor’s professional opinion is that more than 70,000 barrels of oil are leaking per day. Keep in mind that a barrel equates to 50 U.S. gallons. Thus, close to 3.5 million gallons of oil spill into the Gulf of Mexico every day. It has been over a month and at least 100 million gallons of oil are in the Gulf waters. As we learned as children, oil and water don’t mix and bad things happen when they confront each other. Estimates are it may be another three months before a solution is found and this equates to 400 million gallons of oil set loose on our precious environment to wreak havoc on our plant life, wild life and economy for decades to come. How many species may disappear? How many humans will develop cancer? God only knows. Wait! It gets worse. One BP whistleblower claims that a much larger oil rig, the Atlantis, has the same safety violations as this one. If it blows, he claims, it will dwarf what we are going through right now. Nothing is going to stop it if we don’t start addressing this issue. Safety is overdue with BP operations. Millions of people are going to lose their livelihoods and good health because of the cavalier attitudes of the aforementioned characters and entities. Will the U.S. government wake up and start protecting us? BP is throwing “darts” at the problem. They have even used chemicals – similar to anti-freeze – that are more toxic than the oil and it took the EPA weeks before they said stop it. Why was this poison on the market to begin with? We need oil and there are predetermined ways to gather it that will ensure safety to all and no damage to our environment. As this oil flows onto our beaches and into the Florida Keys and up the East Coast and then to Bermuda and other places thousands of miles away, let’s get the process together. This malfeasance is about to give us a whipping that makes Katrina look minor. Harry Alford is the co-founder, president and CEO of the National Black Chamber of Commerce®, www.nationalbcc.org. Email him at halford@nationalbcc.org. Previous articleREJECT Lennar’s toxic EIR! Next articleShirley Q. Liquor: Freedom of speech or hate speech?